"Doesn't anybody stay in one place anymore?..." I don't really have anything to say today but I'm going to try to be less neglectful of my blog. Bullet points may be the best way to go about this post. - I got a new fish. Her name is Gunther. Her mouth is too small for her food so i have to crush it up for her so she doesn't starve to death. - My full thesis draft is due on Friday. A little nervous, hope its long enough, but if its not at least I get a second shot with the final draft. - Also, in regard to this class, I think the professor should understand that more than half of the class are seniors working on thesis and not assign 3 page papers due every class. - While other college students go to some tropical location to party all week for spring break, I will be taking a bus to Scranton to watch the St. Patrick's Day parade. - My neighbors have asked me to live in their house for 3 weeks while they go to Korea. Not sure how I feel about it yet but it should be interesting if nothing else. Also, I decided that I like my posts a lot better when they include a picture. It's kinda like a gift that makes reading my blog more worthwhile. So, for your time, here is a shot of my Passover masks. I just noticed that 2 posts down I got a comment from a certain someone on November 7th to "post something for god's sake!" so I'm following directions. 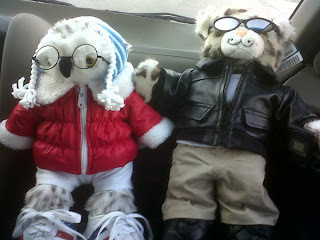 me and Anna went to the Build A Bear Workshop on Saturday. it was our Christmas present to each other. i think we had a pretty good time. apart from the parents, we were easily the oldest people there by at least 10 years. i made the nerdiest looking owl (his head spins all the way around!) named Leland and Anna made a sparkly snow leopard, appropriately named Edward. PPS I almost called Leland "Owlbert." Get it?! Oh, I'm so clever. my best pal, Anna, has a blog too! I know everyone missed me. All 2 of you. I like to wait a long time between my blog posts because i think it will give me more to write about so I'm not boring. Except when I wait a long time I end up forgetting everything that might have been blogworthy. I think thats a good list for now. So my thesis topic is Marie Antoinette. I chose her because one day a few years ago i decided that she was interesting enough to hold my attention. I've already written about her a few times so i decided to take the easy road and write about her again to a much greater extent. 25-30 pages is not really as threatening as it sounds when you already have a pretty good idea what you're talking about. The first "half" of my paper is due tomorrow. I have about 11 pages. I'm pretty pleased with myself. thats all i really have to say about that. Today is my last day of classes for the semester :) i have 2 finals, both on the 17th and then i can forget about the horror that is my philosophy professor. I think he would be enough to fill a whole blog post himself so i'll just say that he's the most ridiculous and useless professor i've ever encountered. And he looks like Dr. Strangelove. You guessed it: still no job. i finally landed a job interview at the dry cleaners to replace Jenn when she moves, but they hired someone else. Thanks, dude. Im waiting to hear from my mom's office about a place in the mail room. the end. That would be Jenn. Some of her family lives down there and she visits them periodically. Sometime back in May or something she tells me she's moving there and i immediately begin crying in the middle of the street :( lame, right? anyway... she's leaving on the 28th and i spend my free time trying not to think about it. But after she leaves her mom is gonna pay me 25 bucks to clean her bathroom once a month. so thats something i guess. we threw her a surprise going away party that i worked really hard to keep a secret. and then when we showed up, no one even yelled surprise. losers. 4. People who hate Texas. I hate Texas. As much as i hate it, i have contemplated moving there after graduation because Jenn told me i could. I know i probably won't. but the thought is still there. A girl in my senior thesis class gave her presentation on Tuesday. In her power point she used "ppl" instead of people. every time. she also discussed "King Author." and in her world a certain music icon would be the artist "formally" known as Prince. Are we not seniors in college? I get second hand embarrassment just by showing up to class with these people. this section was going to include more people but i'll just leave it there. speaking of 5 nephews, i cant wait til christmas when they're all together because its always super fun. and funny. ok thats all i think. So i felt like my summer vacation was wasted this year...i did practically nothing of interest from may to the end of July. Now i find myself wishing that i had some time to do nothing of interest. last Monday i left for Shamokin with Catherine. we weren't supposed to leave until Tuesday but she decided she needed to go right away. we were supposed to come back on Thursday but she decided she wanted to stay until Friday morning. Friday afternoon i left to go stay with my former roommates for the weekend. came home Sunday afternoon and left again on Monday to come down the shore. but only until Thursday morning because Thursday afternoon i leave to go camping with Bridget and bill until next Tuesday. I miss my bed. and my puppy who probably thinks I've abandoned him for life. Right now I'm sitting on the deck of the shore house enjoying the breeze....not enjoying the trash truck that just pulled up. I'm not much of a beach person so i might stay here while everyone else goes. The beach is hot, dirty and covered with children I've never met. i don't enjoy strange children. (oh my god this trash truck smells) Nor do i enjoy heat or dirt. obviously the beach is not the place for me. I prefer the nightlife activities of the shore. The boardwalk, shopping in stone harbor...stuff like that. I'm now being covered in sunscreen against my will. sunscreen is another thing i dislike. I went to Delaware for a week to visit my BFF (or as we say "bb"), Megan. She's living down there for the summer and working at a day care. It was a good time. My sister and my mom were actually there for the first weekend for my nephew's baseball tournament but due to some miscommunication on my mom's part, I did not get to see them or the baseball game. Anyway, i hitched a ride down there with Megan's mom and brother and of course got lost on the way, but we made it and all was well. Among the activities we engaged ourselves in were: mini-golf (I won by a point), Midnight opening of Harry Potter and the Half-Blood Prince (sucked), boardwalk "date night" (walks on the beach, photobooths, ice cream, and shopping), and general goofy girl stuff (self explanatory). We stayed in a farmy sort of area, complete with chicken processing plant, but spent a lot of time in Rehoboth. I haven't been there in I don't know how long but it was nothing like (the very limited amount) I remembered. The only thing I remember very clearly was being on the beach late at night with maybe two other people throwing glow sticks around in the dark. When we went on the beach on our boardwalk night we saw people doing that exact thing and I got excited and looked at Megan and yelled "They're doing my DREAM!" She thought this was very funny but I was being serious. I was a little jealous of those people. I was surprised that we made it to almost the very end of the week without me pulling my hair out because with any of my friends that's what usually happens. But overall the week was a success and we even came up with a few new catch phrases, as usual. I saw Green Day with Anna about a week ago. Very awesome. Best concert I've been to in a long time. Until tomorrow night when I see Billy Joel and Elton John :) if they don't cancel, that is. In which case I'll be sad for a long time. School starts soonish. Still no license or car. Bad news, friends. Oh well. Things usually work out. I can always figure out some crazy bus route til i can drive. Ok. I'm sure this post is way too long and way too scattered and confusing so I'll end here.